Got A Digitization Idea? Send It In! The Indiana Genealogical Society is compiling a list of possible Indiana genealogy projects for digitization and indexing. The Society wants to understand (a) what resources might be out in the state that contain data usable for genealogical researchers, and (b) what has not yet been converted into digital form. The resources may be in printed, manuscript, or microform. They may be a few paragraphs or a few dozen names to hundreds or thousands of pages. What is IGS looking for? The basic parameter is this: Can the material be used to help genealogists find and extend their knowledge of families and individual? What do you know? Be creative, brainstorm, peer into nooks and crannies, open old boxes, check interesting envelopes, ask piercing questions, work with your friends, go far afield, tramp down new pathways, go crazy…Ignore difficulties -- assume everything is doable. No item is too small, no idea is too big! When submitting an idea, include enough detail about project scope and location to allow IGS/others to pursue the project further. Email your contribution to IGS at rdarrah@att.net or mail your idea to IGS, PO Box 10507, Fort Wayne, IN 46852-0507. The Indiana genealogy world will be in your debt. Thanks! Does your society have a special project that would be helped by some extra cash? Consider applying for an Indiana Genealogical Society grant! Your society can be like them! The deadline to apply is December 31, 2015. 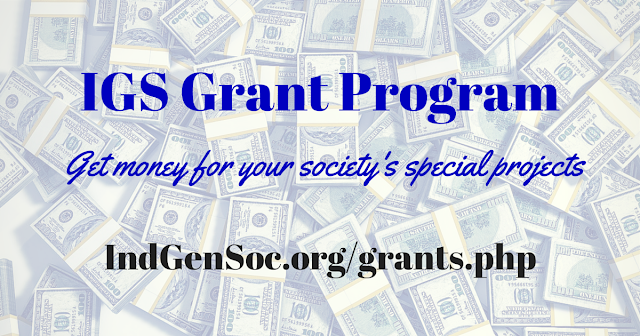 You can find more details and an application form on the IGS website's Grant page. We look forward to helping you with your special projects! I am interested in information regarding James and Catherine Chaves-Sims. James was born in North Carolina in abt. 1828. He was a barber. He might have lived in Kentland, IN, before 1849. He married Catherine Chaves in Terre Haute, IN, in 1849. I do not have burial or a death date for him. I would appreciate any help you can provide. Catherine Chaves was also born in North Carolina abt. 1830. She probably died in Kentland after 1907. I do not have a death date or burial information about her. They were my great-grandmother and great-grandfather. They were both African-American. Searchable digital images of the members of Company 522, Camp SP-3, from a booklet shared by Deborah Loveless. The Civilian Conservation Corps (CCC) was a New Deal employment program that operated from 1933 to 1942. The aim, besides work relief, was to promote tree planting, park construction, flood control, forest fire prevention, and similar environmental tasks. Searchable digital images of the names, positions and home addresses of all school employees, including janitors and employees of the Indianapolis Public Library. This database was contributed by Ron Darrah. Geographical descriptions of what school district each household in Indianapolis would have belonged to. This database was contributed by Ron Darrah. The following are in the Members-Only section of the Indiana Genealogical Society website. Not a member? Join now! 775 students in grades 9-12, as listed in the school’s 1946 yearbook, “The Tattler.” This database also includes digital images. 500 students in grades 9-12, as listed in the school's 1964 yearbook. This databases also includes digital images. 20 veterans and their wives/widows, as listed in annual reports of the Indiana State Soldiers’ Home. This database includes age, birthplace, details of the veteran’s military service and their disabilities. 2,200 students, their hometowns and their subject of study, as compiled from the college’s annual catalogs. 3,300 students, their year of graduation and the degree they received, as compiled from the university’s annual catalogs. Civilian Conservation Corps, Company 522, Jasonville, Indiana, 1933. I have a land grant certificate dated Nov. 1822, signed by James Monroe, referring to 80 acres and a Jeremiah Johnson. It looks pretty much like the front end paper in “A Home in the Woods” by Howard Johnson, though the caption for that one mentions 76 acres in Marion County. Could my document be the one for “Oliver Johnson Woods”?